Researchers at Purdue University, working with the U.S. Air Force, have developed tiny wireless sensors resilient enough to survive the harsh conditions inside jet engines to detect when critical bearings are close to failing and prevent breakdowns. 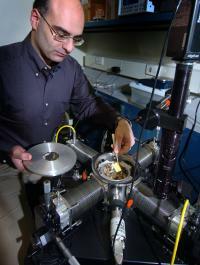 Dimitrios Peroulis, an assistant professor of electrical and computer engineering at Purdue, holds a new MEMS sensor at an “environmentally controlled probe station.” The wireless sensors are being developed to detect impending bearing failure in jet engines. The probe station recreates extreme conditions inside engines, enabling researchers to test the sensors. The University of Trento, Italy, seeks applications for a position for a post-doctoral researcher in the Department of Information and Communication Technology. The position is part of a large project (5.3 MEUR) funded by the local government of the Trentino province. The project includes other local research centers, Siemens as industrial partner, as well as several research groups within the Department. Accenture Technology Labs is taking interest in sensornets. The emerging trend of Sensor Telemetry combines data—historical and current—with two-way wireless communications to offer unprecedented visibility into and management of equipment, products and interactions. It promises organizations more detailed, real-time views, not just of individual business transactions, but of physical state and operations, and human conditions. Sensor Telemetry will also enable organizations to respond faster and even predict incidents before they occur. The plethora of wireless sensor network development solutions offered today is overwhelming. It is not possible in any way to give a comprehensive coverage of the market. There are many open source projects out there. Many of you are familiar with the concept of open source software, where the source code is made available. Not so common is the idea of open-source hardware. What is the idea here? You get the full details of the hardware and firmware as if it were just the code of an open source software project. It is about extending the openness of a project to the hardware and firmware levels. Arduino is one of these open-source hardware projects. It is a family of small printed circuit boards powered by Atmel micro-controllers that can be programed. You develop the code for these micro-controllers using an Integrated Development Environment (IDE) also provided on the project’s web-page, available for Windows, Linux or OSX. The IDE is based on Processing IDE I covered a while ago and the programming language is based on Wiring language. The goal is to make user life easier as the development is aimed to artists more than to engineers. Interesting blog entry available here. Crossbow Technology has pressed the ubiquitous Linksys NSLU2 (aka “Slug”) into service as a network gateway. The Stargate NetBridge enables remote access to data collected by the company’s wireless sensors, and runs a customized embedded Debian OS along with specialized applications. Crossbow, a provider of wireless sensors such as the Linux-powered Imote2 introduced in June, says the “easy to configure” Stargate NetBridge gateway enables network-wide access to sensor data via a Web browser. The company claims the device offers plug-and-play connectivity with any of its BU series of wireless sensor network base stations. Although the Stargate NetBridge is a variant of the Linksys NSLU2, “both hardware and software have been enhanced specifically for the sensor network data appliance application,” Crossbow said. I’m trying to finish the introduction chapter to my MSc thesis on WSNs and was trying to find out if there have been any studies on actual deployments where the nodes were deployed randomly to study large scale environmental catastrophes like floods/fires/avalanches/etc. I know the random deployment is the ideal in the vision of WSNs, but none of the examples I have seen, seem to try this.